Our vertical balance system (vestibular system) depends upon our eyes. An airplane’s horizon indicator system has a gyroscope that does the same job that our eyes, inner ears and subconscious mind do. It shows the pilot where the horizon is and how much the plane is deviating from level. Our vestibular system does that job—and a whole lot more1. It also tells us which way is up. We must get the gyroscopes in the brain to handle the job of vertical stability. When moving from a placid state to standing, we must give our body and mind some time to make adjustments. 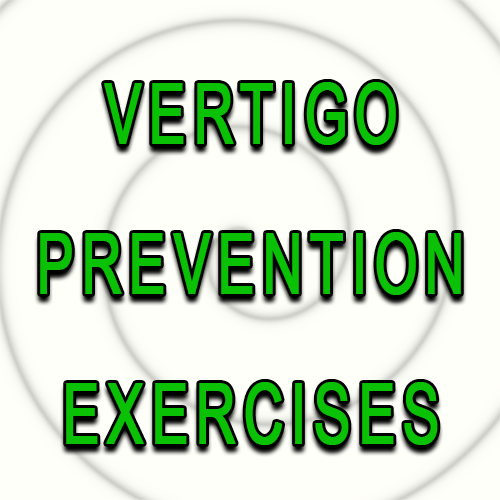 Vertigo prevention exercises help. We know that the blood has pooled in our legs and other parts of our body. It doesn’t matter if you drive a truck, fly an airplane, work at a computer or do police work. Our lifestyle and work requirements, demand lengthy hours of total mind attention, and will not permit much physical movement. This places new demands on our motor-control mechanisms—our physical balance system needs some time to adjust. We don’t know what our vertical balance system is doing moment to moment. Our conscious mind remains unaware of what our horizontal positioning system is doing. Our conscious mind never asks us what it should do to keep the body from falling. The subconscious mind uses the myofascial muscles (the slippery strands of muscles that are out of our conscious control and are buried within our large muscles) to make adjustments to the playing field. You can have fun experimenting with this vertical control system. Now is a good time to try some movements to get the feeling of how this system works. We will begin with your eyes, inner ears and neck muscles. This group aids and abets your vertical positioning. We will work with the eyes first. Most of these exercises can be done sitting, standing, lying in bed or just about any place where you might be—or in any position. No one muscle of the body works in isolation. Furthermore, all muscles will voluntarily perform their work at any time you imagine them doing it. The eyes move first in any direction that you intend to move2. These first exercises will be done with your eyes closed. Virtually all the muscles in your body will follow the eyes—even when they are closed. These gentle sensations throughout your body—from your toes to your skull will show you that the slippery little muscles (myofascial muscles) within the large muscles are doing the job of keeping you oriented to the horizon. Happy camping! Have one finger available to touch a wall or some item for support in case you lose your balance. Have fun with the following as you watch and feel the movements—from your toes to your skull. Stand with both feet tight together. Also, with your eyes closed, rotate them all the way around a few times to get the feel of the little movements throughout your body. Rotate your eyes in wide circles a few times until you feel the myofascial muscles—the little slippery guys within the big muscles—all the way from your skull to your toes. Pay attention to this and you will benefit through the years ahead. Now switch your eyes far left and far right—still closed. Use your imagination to search out far places, like California and Canada. When you are comfortable with this we will begin with the head and neck orientation movements. Move your head to one shoulder then to the other. Remember that your eyes are still closed and your whole body is relaxed. Do these exercises any time you want to relax and give yourself a short break—like two minutes. After assuring yourself that everything is OK and you are having no trouble, we will begin some head rolling. Relax your head, shoulders and neck. Pretend there is a clock on the ceiling. Roll your head gently around as you have your eyes follow the clock. Go ten times in each direction. Feel the muscles throughout your body as they respond. When you are ready for more strenuous exercises you may want to try my core muscle workout. That may be a long way off for you. It may not be necessary. Mayo Clinic has another good exercise program on this subject. These vertigo prevention exercises start you on your way to better balance. The Cleveland Clinic has a nice program to visit. How successful is vestibular rehabilitation therapy? Many times vestibular rehabilitation therapy will be the only treatment needed. Other times, it is a part of the presurgery/postsurgery treatment plan. In most cases, if patients continue to perform the exercises they have learned, balance and dizziness problems decrease significantly or completely disappear. Awareness through Movement: Moshe Feldenkras2.